Buying cheese in Northern Virginia is easy. At Safeway, located at 9596 Old Keene Mill Road in Burke, only minutes from Washington D.C., they offered the following kinds around the year 2000: Cheddar, Cheddar and Cheddar. If you were lucky, you would find some Cheddar too. Things looked very different at Trader Joe’s at the Pickett Shopping Center in Fairfax. Here they had Camembert, Leerdamer and Gouda, imported from Europe. But the price tags could give people heart attacks. Cheese in North America? A difficult subject. Across the pond, in a continent called Europe, they produce cheese like crazy. There are hundreds of kinds in several categories. Soft cheeses, semi-soft cheeses, fresh, medium-hard, semi-hard and hard cheese. 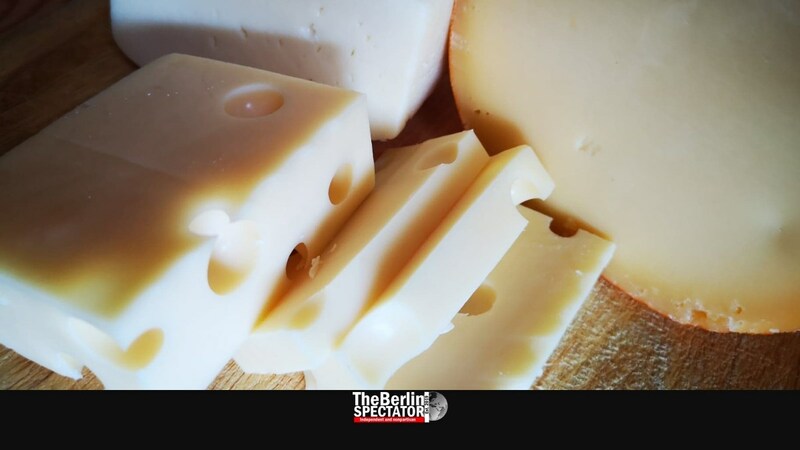 There are mold cheeses, processed cheeses and brined cheeses. Europe is all about cheese. Say cheese! The French et les allemands are known to produce cheeses which literally stink like hell. If not sealed in plastic foil or locked in a proper container, transporting that stuff is tricky. It should be hung up on the external rear view mirror during the trip. Munster, Limburger, Pont-l’Évêque, Harzer, Chaumes and Romadur are among the most stinky cheeses money can buy. The problem is that they are among the most delicious ones too. The Belgians and French produce the greatest cheeses. So do the Swiss who also love melting certain kinds. There are several different recipes for cheese fondue, and no matter which one it is: There is nothing better on this planet. Cheese fondues are calorie bombs, but they sure as hell taste good. And there is Raclette, which the Swiss melt in a machine with one little drawer for every bite. Cheese counters in more expensive German supermarkets are fascinating spots because some of them offer 200 kinds. If anyone wanted to try a tiny piece of all of them in one go, he or she would need to be rushed to intensive care afterwards. 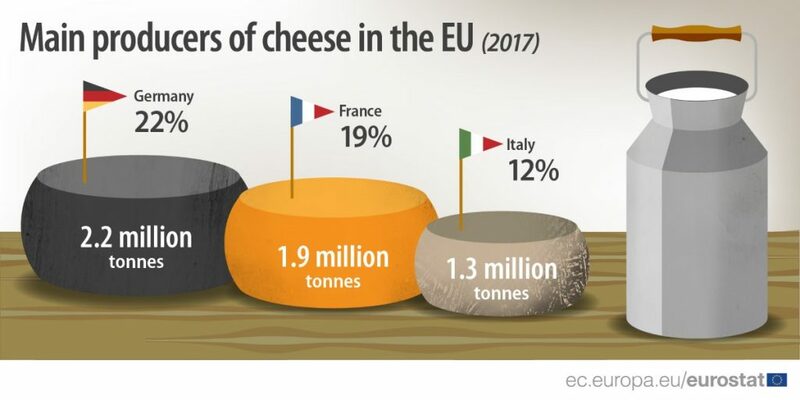 The folks at Eurostat, the European Statistical Office, might have had their share of cheese too, because the formula ‘cheese = good’ does apply. But they also came up with the latest relevant numbers. In 2017 (the 2018 numbers will be released next year), the E.U. member states produced 10.2 million tonnes of cheese. In one stack, all of that cheese would probably reach Jupiter. A total of 75.5 million tonnes of milk were used in the production process. Most of it was made from cow milk. Fresh cheese is the most popular kind in the European Union, followed by medium hard cheese and hard cheese. And the Dutch produced most of it, right? Wrong. The Germans did. They made 2.2 millions tonnes, the French contributed 1.9 million and Italy 1.3 million tonnes. Sure, the Dutch and Poland are big cheese producers too. But it’s not like those cheese producers eat all of it on their own. Well over 5 million tonnes were exported by E.U. member states in 2017. The largest share, 4.4 million tonnes, was traded within the E.U., Eurostat says. And the winner is: Germany. Say cheeeeese! The Germans exported 1.2 tonnes in 2017, the Netherlands 0.9 million tonnes, while France exported 0.7 million tonnes. Mais, oui! More numbers? No problem. Out of all that E.U. cheese, 830,000 tonnes were exported to non-E.U. countries, including to the U.S., in order to satisfy those Trader Joe’s folks and their more wealthy customers. But guess where most of the non-E.U. cheese exports ended up: In Switzerland, which makes the most delicious cheese itself.